Are you "stymied in [your] quest to raise money from businesses”? Are you letting opportunities slip away”? 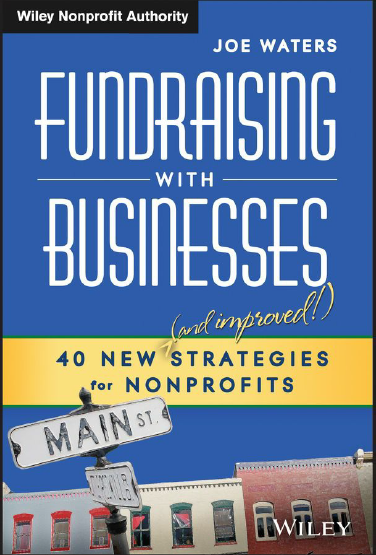 Joe says he wrote this book for “all the nonprofit professionals who answered, “I don't know” when [he] asked them what type of fundraiser they would propose to a potential business partner." These are just a few examples of the 40 (count em!) ideas for working with businesses. While Joe is rumored to have a “wicked Boston accent”, what I like is his straight-talking, no-nonsense writing style. And his new book is no exception. This book offers both inspirational and actionable ideas – with actual case examples that help you wrap your head around these strategies. There are also practical tips and steps to take in getting started with each of the fundraising ideas. As an added bonus, each chapter has a QR code as well as a URL that links to a Pinterest Board (see example here) full of ideas. Joe notes that he wrote this book for small non-profits, and speaks from and uses examples from his own experience (working for the local chapters of two voluntary health organizations, selling memberships for a local chamber of commerce and underwriting for Boston's public television station). But he wants to inspire small non-profits to think big and beyond the traditional forms of fundraising with businesses. There are many crowdfunding sites out there that would be helpful for raising money as well. My favorite so far is rockethub. They are partnered with A&E, A&E picks certain businesses from there and showcases them on their television channels. Just thought I would give my 2 cents.